If you own a backflow preventer, copper theft is always a concern. Backflow preventers are targeted for the precious copper and brass used in their construction. The rising prices of metal materials make stealing vital equipment worth the risk to thieves looking to make a quick buck, despite the massive damage it can cause. Investigators with the National Insurance Crime Bureau say they see thousands of bronze, brass, aluminum, and copper theft claims each year. And many of those claims are on commercial policies. The good news is the number of metal theft claims is decreasing. Part of the reason for the declining numbers is local law enforcement agencies creating stiffer penalties for thieves. But we’re also developing much better ways to protect backflow preventers from copper theft. Here are a few. The Department of Energy says copper theft causes nearly $1 billion in losses to U.S. businesses each year. Scrappers do not consider or care about the destruction they cause by stealing vital equipment. They will do almost anything to get their hands on scrap copper and brass — even if it means causing massive damage. Backflow water lines are left flowing freely. Water shoots straight into the air, creating pools of water, leaving drinking water systems vulnerable to contamination. Astronomically high water bills because water is continuously flowing uncontrolled. Excessive water builds up, causing flood damage to other equipment, which can mean costly repairs. Businesses can shut down because of the disruption in the water supply needed for manufacturing products or for drinking. Unplanned expenses for the salaries of workers repairing the damage. By taking some precautionary steps, it is possible to effectively protect backflow prevention devices. Paint, label or coat the backflow preventer. By spraying the equipment with truck bed liner or other paint, it will decrease the scrap value. Stamping, labeling or identifying the metal with a recognizable code will also discourage thieves. Cover the backflow preventer with either a protective cage or enclosure. The new cover should be secured or mounted to the ground. Cages should be spot-welded to the bolts. Secure. The cage or enclosure needs a high-quality lock. Adding a lock guard will prevent potential perpetrators from using bolt cutters. A “hockey puck” style lock works best for cages without a lock guard. Post Warnings. Hang easily visible signs that warn people about security measures and prosecution. Consider plastic options. Plastic backflow preventers contain minimal amounts of brass, making them less valuable for thieves. Hide and conceal. Disguise the backflow preventer by covering it and grouping it with the natural landscape and other surroundings. 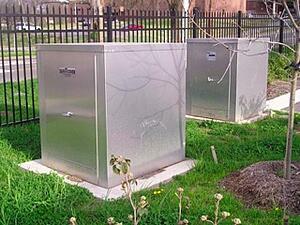 For high security and industrial locations use a heavy duty enclosure box. Cage versus Enclosure, Which is Better? Both cages and enclosures offer protection from copper thieves. Where the backflow prevention valve is located, climate and the level of protection needed will determine which one is the better choice. Cages are an economical option for keeping thieves away from your backflow devices because they provide basic protection. They are better suited for warm weather climates, however, they can be used in cold weather if the backflow equipment has been winterized. Cages are also a good option for applications where the valves are seasonally removed. While this is an inexpensive and fast deterrent for scrappers, cages can be removed by crude methods. A common way thieves access equipment is by wrapping a chain around the cage, tethering it to their vehicle and as they drive away the cage is compromised. Cages are a great option for residential use and smaller backflow equipment. Enclosures provide complete protection, not only from potential thieves or vandalism but also from Mother Nature. They’re insulated and are effective at keeping equipment warm in cold climates, especially with the help of heaters. Unlike cages, they conceal the backflow equipment so thieves won’t know what is inside, dissuading them from trying to pry it open. You can also design a backflow enclosure that will easily blend into the surrounding environment. This includes using stylish wraps that can be customized with company branding and designs. Copper theft is a plague terrorizing homeowners, business owners and city officials across the U.S. and globally. Scrap metal thieves cause massive damage that costs the owners thousands of dollars to fix, causes entire systems to fail and threatens infrastructure people rely on. 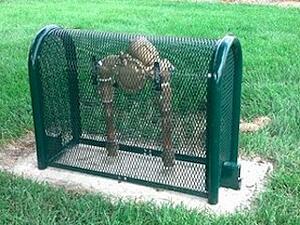 Backflow cages and enclosures are the most effective way to combat copper theft. They are an economical and quick fix to keep business running. Choosing the correct protection for backflow equipment can be difficult, and it is a big decision to make. The experts at Safe-T-Cover are here to help. Contact us today to learn more about how backflow theft can be effectively prevented. We have plenty of standard sizes, but we can also provide a custom quote. We will design an enclosure to fit your equipment needs. Don’t overpay for a standard size that’s too big for your equipment.